The adult 1 class has been designed to encourage health and wellbeing, and to provide a friendly and supportive environment to work on individual strength, flexibility, and fitness. Students learn a variety of aerial skills including climbing and tricks on all our apparatus including things like aerial silks and trapeze; master basic acrobatics like rolls, cartwheels, and begin working toward handsprings and walkovers; learn basic trampoline skills; group and partner acrobatics; juggling; and handstands. In each class, students will also spend time stretching and working on building strength to be able to learn more advanced techniques in the future. This is a great way to get in shape and have fun at the same time! There is no need for prior gymnastics or other athletic background - everyone is welcome. 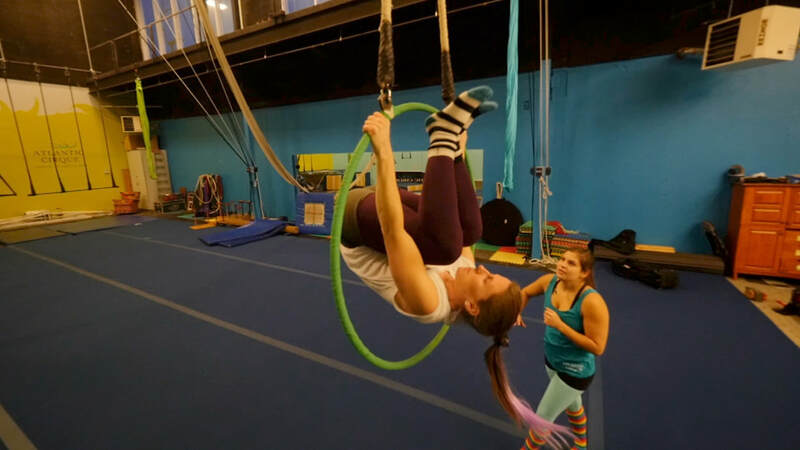 ​This class was designed for adult students who already have experience in circus arts. ​Emphasis in this class will be placed on perfecting technique, form, presentation, flexibility, and strength, as well as developing advanced skills. In this class, students will work independently, in pairs, or in groups to develop unique circus acts. ​If students in this class have an interest in performing, and perhaps in performing professionally, they might be invited to join the Senior Troupe. We are glad to inform you that you can register anytime to any of our classes (up until 4 weeks prior to the end of term show) as long as there is space available and you will only get charged for the remaining classes!